Mini terraced villas of nearly 70 m2, with spa and private garden, comfortable, built with healthy materials (monomur and lime), all air-conditioned. Residence of small volume, located in the maquis, calm and tranquility at the rendezvous, 10 minutes from the center. Double sink marble, teak bench. Shower column with micro jets and marble mosaic floor. Towels provided. Separate toilet. SPA 5 seats. Covered terrace with exotic wooden table and chairs, garden chairs, barbecue (Weber). Interior and exterior lime associated with single-wall, providing a feeling of well being, in keeping with the surrounding nature made wild bush. PROMOTION MAY costs € 590 / week cleaning included free for 2 adults and 1 child. 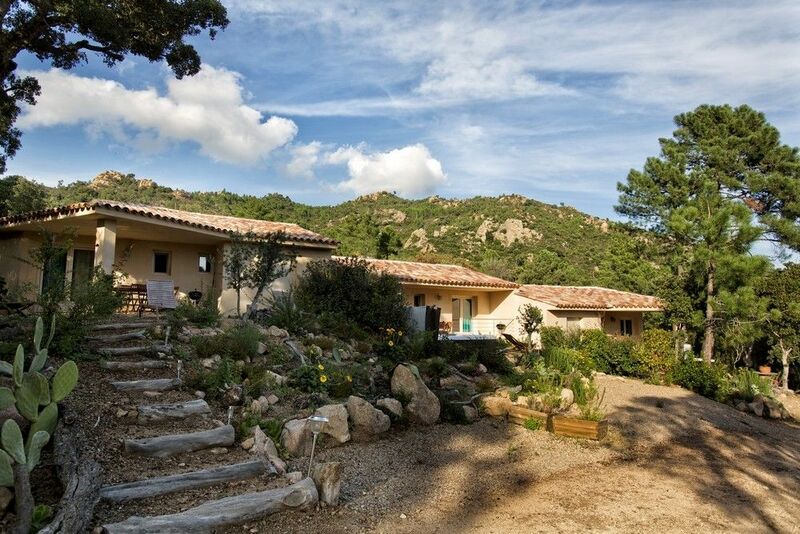 Near THE MOST BEAUTIFUL BEACHES OF CORSICA, Palombaggia, Rondinara, ..., nice new residence, quiet, privacy of each house with spa and private garden. Porto-Vecchio: Direction road Ospédale, 7 km: Ferruccio branch, 800: Casa Terra Mare residence. Golf: One of the finest golf courses in Europe, is near: The Golf SPERONE towards Bonifacio (1 hour drive). LA LOCATION SE FAIT DU SAMEDI AU SAMEDI, LE WE DEBUTE LE VENDREDI, SE TERMINE LE DIMANCHE. La location peut se faire pour 1,2, 3,4 semaines, à prix dégressif sur le hors-saison eau et électricité, compris.